Thank you for your interest in Intracellular Low Cost Electrometer. Please complete and submit the form below and an ADInstruments representative will aim to get in touch within one working day. If you’d like to speak to someone immediately, office contact information is available from the contact page. A low cost version of the research-grade Intracellular Electrometer. The important features required for low noise, drift free recording from glass microelectrodes have been retained in this lower cost model. 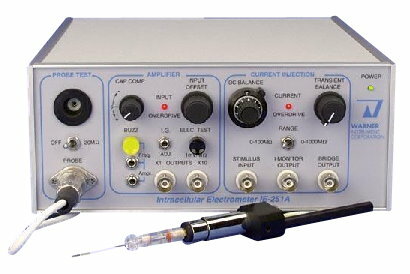 The Intracellular Low Cost Electrometer is easy to use and is an excellent choice for student teaching laboratories. It includes a very small active headstage, essentially the same as used with the Intracellular Electrometer. Epoxy-sealed construction affords maximum resistance to saline corrosion. Its small size and low mass permit easy mounting in a micropositioner. The supplied probe connects directly to the probe input on the Electrometer. E Series Electrode Holder (base your selection on the outer diameter of your electrode glass). Fixed gains of x1 and x10. Capacitance Compensation neutralizes input capacitance for up to 50 pF. Junction potentials of up to ±200 mV are nulled with the DC Position control. Electrode Test provides convenient electrode resistance check. Push button operated Buzz produces oscillations at pipette tip to facilitate cell impalement. Convenient Probe Test port permits fast check of amplifier performance. Bridge balance circuitry of the IE-251A-V allows simultaneous stimulation and recording through microelectrode resistances up to 1000 MΩ in two ranges. Voltages at the Stimulus Input are converted to constant currents applied to the electrode. The steady state and transient components of the current injection artifact are nulled with the DC and transient balance controls. The corrected signal is viewed at the single-ended bridge output. Electrode resistance is read from the DC balance ten-turn dial. Input Overdrive is illuminated whenever the probe input voltage exceeds ±1 V, caused by either excessive current through the microelectrode or an open circuit (open or blocked electrode). Current Overdrive warns of excessive voltage (>50 V) applied to the Stimulus Input.